It was one year ago that I had to make that trip. The vet had called me and told me that although things had been looking up the day before, when Mugsy woke up this morning and the vet looked at her, he knew she would not recover. She couldn’t feed herself or move and there was nothing we could do. I had lost 3 other ferrets at this point. Mugsy had been the first in my family and the last to go. She was the most loyal pet you could ask for. She would always cheer me up when I was down. Somehow she always knew how I was feeling. People will judge you for being too attached or close to a pet, but I don’t really care. I had her for 7 years and, except for a few trips I made, was responsible for her care every day. She came with me to Virginia Beach and kept me company in a place where I knew no one. She was my navigator for the many trips home as well. Like any pet owner I have many regrets – things I should have done or shouldn’t have done or should have done more. But you do the best you can and hope that it’s enough. I think my ferrets had a good life. I hope so. 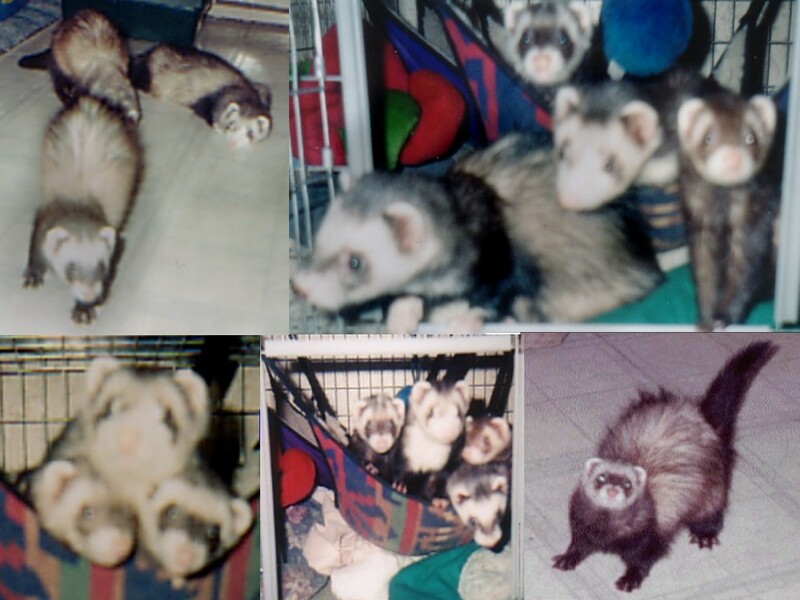 Unlike my other 3 ferrets who died from cancer, Mugsy had survived cancer for several years. She had a different type that we were able to control. But she was getting old and her vision and hearing was not as good as it used to be I think. A friend was holding her, I picked up a plastic bag and the noise was enough to startle her. She leapt from my friend’s hands and hit her head on the floor. I think he blamed himself, but I never did. I did blame myself for a long time because I scared her and because I didn’t check her well enough after. She seemed ok, but shortly after my sister said something was wrong and when I looked at her my heart broke. I spent that night with her on my chest, talking to her. I couldn’t sleep and she couldn’t really move. The vet gave me hope – I thought she would be immediately put down – but as I mentioned before that hope was dashed one year ago today. I thought after losing the other 3 ferrets, after almost losing my dad and after my brother’s accident it would somehow be easier. It wasn’t. After I said goodbye and saw her fade, I went numb. I don’t think I felt anything for a week. I had to puppy sit for the next 2 weeks and I was so numb that as my friend lost her dog – the mother – and 5 of the 6 puppies I just couldn’t grieve anymore. I felt bad for her but my heart couldn’t hold any more pain. It’s funny because all the things I used to get irritated about sometimes – having to take hours out of my day to let them out and make sure they didn’t get hurt, stopping them from getting into or breaking my stuff, etc. – I miss. They could break anything I have if I could see them one more time. I still wake up sometimes and think “ugh, I have to get up and let the ferrets out.” When I realize I don’t have to it only depresses me. I don’t know what else to say other than I miss my ferrets everyday and I hope that this will never change. Today will be six months to the day when I lost my last ferret Mugsy. Sometimes, I find it hard to even realize that she is gone. But the more I thought about it, the more I realized being sad will not honor the memory of my furry friend. Ferrets are a misunderstood pet and many people are misinformed about them. So I decided to post the top 5 reasons why you should welcome ferrets into your life. 5. No other pet will be more loyal or make you laugh more. I’ve had dogs. I had a very good dog. But my ferrets were the best. They knew me by name and face. They were always happy to see me. I was the best thing in their eyes. Their antics and the stories I have still bring a smile to my face. 4. They are always happy. When I let them out of their cage it was like I was giving them the greatest gift in the world. When I chased them, they only liked it more. My only regret is that I thought I would have more time and didn’t do more of either. 3. The only thing more fun that one ferret is two. Or three. Or four. I had only planned on getting 3 ferrets and ended up taking a fourth one in. He proved more work than the other 3 combined. But he was awesome. 2. You can’t help but smile when ferrets get going. I have so many stories of them tackling each other, of the smallest dragging the largest by the scruff after he tackled her, of them getting so agitated by my sister putting their toys away that they’d actually come over and dook (scold) me, and of them teaming up on my cat that I can’t even go into detail on them. I still smile whenever I think about it. 1. You can’t say you’ve lived a complete life until you’ve seen a “weasel war dance.” When a ferret gets extremely happy and/or excited they hop around, tossing their head and expending energy frenetically. It’s extremely hard to explain the weasel war dance. But I dare anyone but the most cold hearted among us to see this in action and not want a ferret in their life. I cannot get more ferrets at this time. But after much thought I’ve decided that when I do get my own place, I think I will get more “carpet sharks.” I’ll never be able to replace my original foursome, but that’s not really the point. I hope after reading this you give ferrets a chance. They’re not stinky rodents – it’s more like having a kitten that never grows up, but many times more energetic. Sometimes, life likes to come up and kick you in the teeth – figuratively speaking. I recently relocated back to New England from Virginia. Moving from your own apartment to back into a parent’s house is never fun. At all. 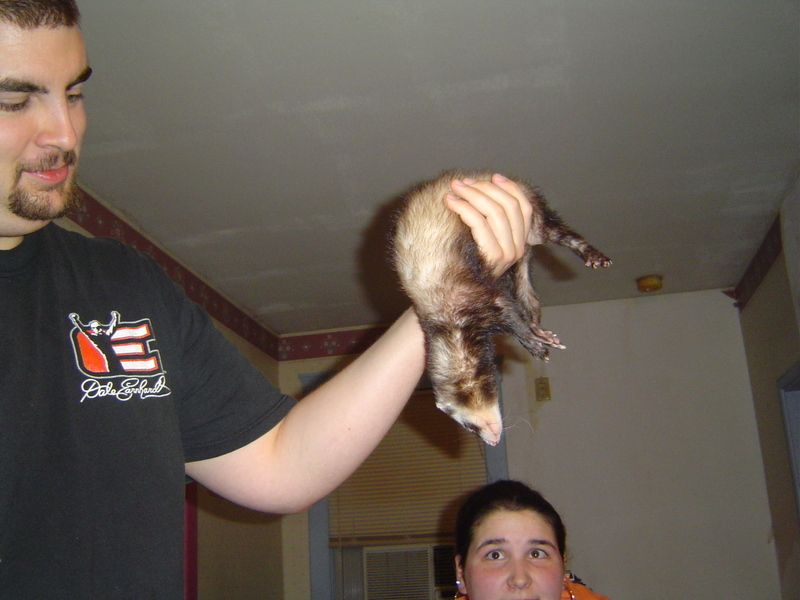 Add that to the fact that a month ago last Monday I lost Mugsy – my last ferret. This one was not much more fun then the rest. No cancer, but an accident cut her life short and I had to put her down. It’s the hardest decision you can make – especially when the pet is your sole responsibility. I hate doing it, but it’s worse to watch someone you loved for 7 years suffer just so you can have a little more time. And just like that I have no more ferrets. It’s almost like that old saying (song?) – “this is how the world ends… not with a bang, but with a whimper.” The same day I had to make that decision I went back down to VA to help a friend. And in the process of puppy sitting, she lost her mother dog and 5 of the 6 puppies – and I thought I had it tough. I can’t imagine losing a young, perfectly healthy animal and then most of the reminders of that pet. Unfortunately, with the loss of Mugsy I don’t think I was much help, I just couldn’t process any more grief. Fortunately, I have a new person in my life that has helped to ease me through these changes. It was sort of ironic, like before she went Mugsy wanted to make sure I was taken care of – like she’d done the past few years. Not big on dumping out my feelings, especially in a public forum, but with the long absence I felt justification was deserved. I’ll be back to having more web design info, sites and thoughts soon. Random Tidbit: I wanted to give something web design related. So for those of you who are new to blogging, I stumbled across 2 interesting articles. One talks about 5 ways to build a better blog – content is the key – and the second talks about 21 tips to starting a blog successfully – some good ideas in there I could have used a few months ago. Enjoy. As some of you may or may not know, I lost my third ferret Scooter earlier this year – February 11th. Scooter was the last ferret I adopted and he loved life to the end. 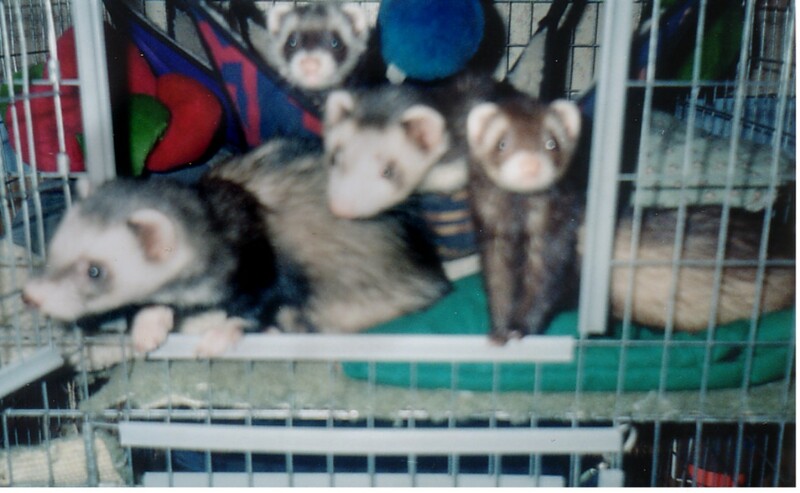 He was also the one that seemed to miss Bogey (my first ferret lost) the most – they used to play together. I am now down to only one ferret – Mugsy, my first – and it’s kind of sad to think that once she goes I will be without ferrets for the first time in over 7 years. I cannot even remember what it felt like. Such a big part of my existence the past few years has been taking care of them, playing with them and laughing at their little antics and idiosyncrasies. So much so that I named my site (www.bogeywebdesign.com) after one of them and my blog after one of their best traits – the weasel war dance. If you don’t know what this is, I almost feel bad for you. I can’t really do justice to it in words, but basically the ferret arches it’s back and hops around mouth open and you can almost hear them saying “bring it on, let’s go!” Because they are related to weasels and look like rodents (though they are not) a lot of people don’t like them. I don’t see how anyone seeing this display of enthusiasm, energy and just pure love of life could not fall in love. Anyways, if you have lost a pet or loved one, I feel for you. I have been fortunate enough to not lose someone in my immediate family – though there have been close calls. I can’t imagine what that would feel like for someone. Update: Mugsy has been kind of moody and depressed. Not sure if it’s because she’s all alone, or because of the recent relocation. It’s tough.